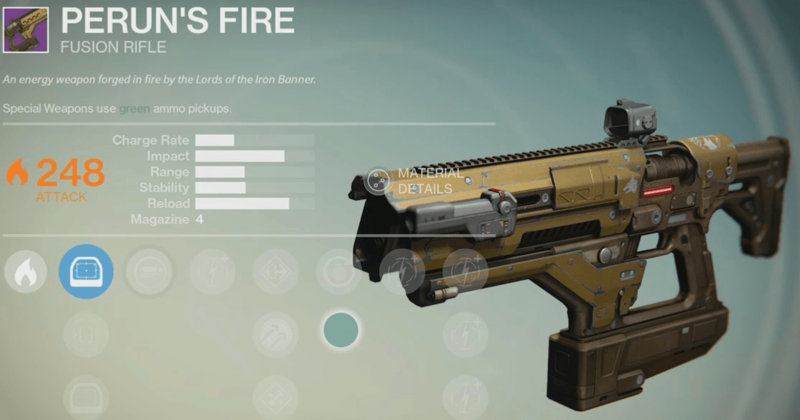 Fusion rifles are very different to other weapon classes in Destiny. They spit a volley of elemental rounds that tend to erupt in a cone pattern, and being closer to your target means more of these rapidly dispersing energies will land on your mark. You’re either a lover or a hater of them – and the controversial opinions of how powerful or how frustratingly annoying they can be is understandable. Blast pattern on a Fusion Rifle burst cone is a little wider. Close to medium range volleys are largely unaffected, but at a distance the projectiles are less likely to land hits on a single target. This reduces the reliability of landing a one hit kill at far range, and makes the weapon better at spreading damage into a group. Initial starting ammo is reduced across all ammo stats. This is change primarily affects The Crucible. Starting a Crucible match, you’ll have less Fusion Rifle ammo in reserve. 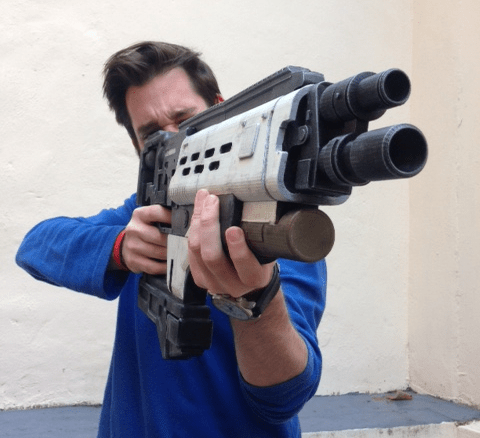 Print your own Fusion Rifle! Fusion Rifles, in short, charge up to fire a volley of rounds of one of the three elemental Damage types; Void, Arc or Solar. This makes fusion rifles ideal for taking down the shields of larger and more threatening enemies in PvE. Fusion Rifles are much more effective when aiming down sights. It tightens the spread of all of the projectiles and increases your chance of an instant kill. You only have to be looking down sights as the rifle begins to fire, aiming down sights while it charges is not necessary as it will cumber your movement and sacrifices valuable agility during combat. When you get a better feel for your charge time, you will be able to snap down sights just before firing. When battling it out in the Crucible, most of the time you’ll find it is necessary to land a complete charge for the kill. This is where ADS is crucial if you want to win a firefight with one charge against a fully shielded foe. Fusion rifles do not suffer damage falloff, but range affects fusion rifle projectile speed. The blasts travel more quickly when you have a mod like Hammer Forged, making it easier to hit a target at medium range with more of the shot. The variety of fusions are usually balanced between charge time, Impact and range. A quick charge time makes for an easy to use close-range fusion rifle, but in PvP, don’t expect to beat a shotgun at point-blank range. In PvE, the charge time can influence how you utilize cover, with longer charge times allowing you to stay behind hard cover while you prime the charge, stepping out for just a moment to unleash a powerful blast. Generally if you have a slow charge time, you’re going to hit harder, but if you have a fast charge time, your shots are weaker. The charge time varies between models and which means that any Guardian who gets too close will usually have the advantage. With a shorter ranged model, it can be difficult to get all beams to hit a moving target (especially crucible) and can require multiple charges to take an enemy down – a shotgun or auto rifle wielder will usually have you eating dirt before you get a second charge off. For targets further away there is a sharp fall-out on range, especially with beams spreading further at more distanced targets. The variation in charge times also gives it a broad range of scenarios to fill while also giving a new learning experience to make the most out of the weapon; especially for Crucible will you want to know your charge time for peeking around a corner to get off a shot. Fusion rifles are incredibly diverse weapons. They come in many shapes and sizes and perform in a verity of ways. To decide effectively which fusion rifle to use and how you use it, you must break down your playstyle and favorite activities. When you engage foes in Crucible you can’t predict every scenario. Stability compensates for anything from close quarters to medium range. Many Fusion Rifles are pre-equipped with the punch to take out a player at most ranges, just as long as you land your shots. Recoil on Fusion rifles can be very different, this is why it is important to get a feel for a specific one before truly deciding if it is for you. Some have a lot of Vertical Climb, Some Veer off in random directions and some have a larger cone. Vertical climb is much easier to compensate for: Just fire lower down on the target. The other Recoil types are harder to control, and if you are having difficulty, be sure to take a good look at the first column upgrades. The first column contains changes that not only affect the optics but also change how it behaves when you fire it. Although the Red Dot-ORS1 gives a fantastic open view as well as adding some extra zoom, it might not benefit you as much since it doesn’t offer any additional recoil control and may deduct from your stability. The Sureshot IS may not offer a very clear picture of your target but it enhances your handling substantially and prevents random recoil patterns, which is important for delivering that one shot kill. Sometimes you will have the best possible stats across the board; PLUG ONE.1 for example has a great Impact, Stability and Range, as well as a very precise recoil pattern. However, when you come face to face with another Guardian, charge time is most important. When you are in kill-shot range and have no interference or obstructions, the kill goes to the person who fires first. Sometimes the time in which you charge and fire can be the balancing point between life and death. Outside of the Crucible the priorities are very different. You want to pack as much punch into your Fusion Rifle as possible. Fusion Rifles a very useful for knocking off the shield of stronger foes, and high Impact means that shield and possibly the entire enemy will be vaporized in one shot. When it comes to fighting NPCs, you want to make sure your Fusion Rifle hits hard and far. Arguably, NPCs aren’t as threatening as other players, and you get more of a ‘right of way’ when charging the rifle. The most important feature for fusion rifle use in PvE is how much health your opponents lose with each shot. You’ll want to invest in agile sights with good target acquisition. Use comfortable optics and focus on what other secondary stats come across as most suitable for your playstyle. It all depends on what you are looking to maximize. If you want a versatile/snappy rifle for close quarters combat, you’ll want to increase charge time and movement speed. If you want something strong and reliable, you’ll want to focus on Impact and accuracy. Sometimes you’ll be in a situation where mobility is crucial, looking down sight may blow your only chance of survival that only extra agility can preserve. Hip fire tightens the spread of the projectiles and will substantially better your chance of a much needed hip fire kill. When you are in the heat of a battle, you will pray for that extra second between your next encounter. Feeding frenzy will allow you to reload especially quickly after your last kill, saving you vital seconds of defenselessness. While up close you won’t want to miss a single shot. Unflinching will dramatically reduce the shaking of the weapon while under fire, making it much easier to land your shots. A very useful option while shooting from afar as well, as landing your shots will be more difficult and any extra stability will be very valuable. 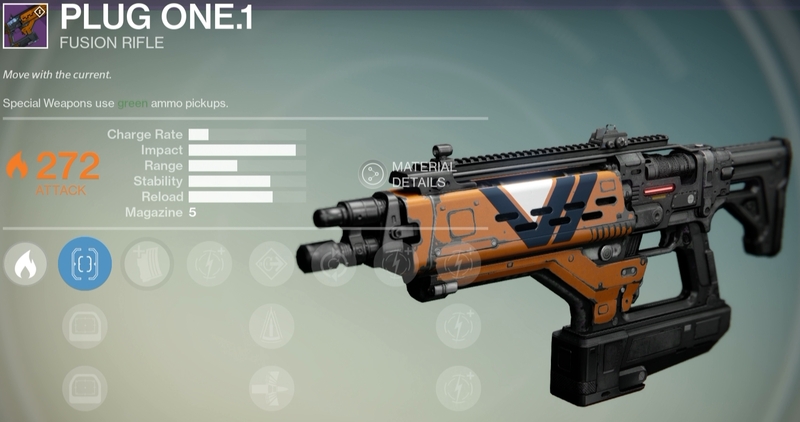 Perhaps the most desirable fusion rifle perk of all time, a gift from the Traveler itself. Faster charge time further negates the major issue with Fusion rifles, and that is delayed firing sequences. You can save yourself valuable split seconds in an encounter and totally turn the tides of battle. Put quite simply, additional stability will help you keep your weapon under control with every charge fired. Here are our top 5 Legendary Fusion rifles picks based on versatility, damage output, stats, & default perks. You can help out too by sharing your opinions with us about which Fusion Rifles you think are the best. The more input the better! This fusion rifle is super easy to use. Anyone can lay their hands on this beast and do some serious damage. It has the highest stability, a super-fast reload and high Impact. This weapon is also pretty painless to acquire at just 150 Marks and a Commendation. It is wise investment and great weapon if you are looking for a starting Fusion rifle. This weapon takes on a deadly reputation in a way you wouldn’t expect. It almost has the slowest charge rate, but its Impact should truly be feared. This is a weapon deals massive amounts of damage with each shot, making it awesome for close quarters or longer ranges. The recoil remains very firm after firing so your shots will have a minimal spread. It will gift a talented user, but if you have a tough time with fusion rifles in general, it will be harder for you to get as much out of this one due to its slow charge rate. Sadly this is a hard weapon to find as it only drops in Vault of Glass hard mode. This is just an outright deadly weapon. It has the two qualities you really want; fast charge time and fair stability. It is fantastic for just about everything. It has perks that are adapted very well for PvE encounters, tearing up Hive Majors with ease and bonus accuracy firing from the hip. A weapon everyone should own, it has great qualities right out of the box. With awesome sound effects and appearance, this weapon is instantly recognized. The most outstanding qualities of this weapon are its stability upon firing. It is incredibly useful to use as the spread of the projectiles remains very tight. One of its most favorable qualities is its versatility. You are able to switch damage types which alters its stats. Solar will grant more punch and stable fire, while Arc grants your that extra charge time and agility (use Arc for PvP). 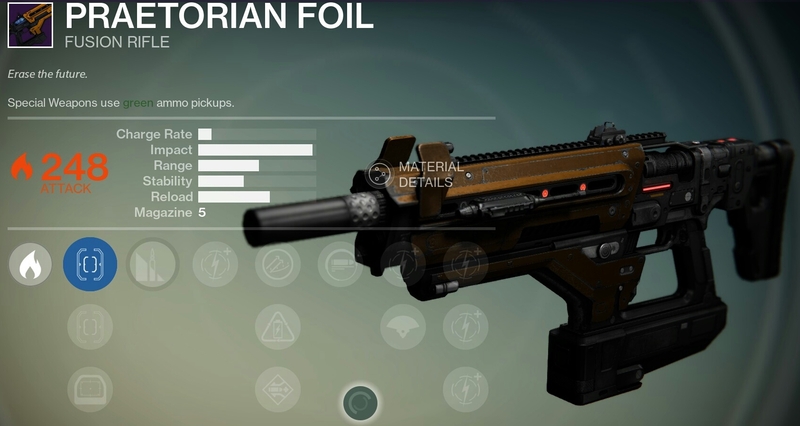 Exclusively obtained during the Iron Banner, this weapon is built for Crucible. It has a fantastic charge rate and reasonable recoil pattern. If you are looking for a deadly weapon to get up close and personal with, this is a nearly perfect option. What’s even better, is if you have the Motes of Light to spend, you can get all of the perks and damage types you want. Get your hands on your favorite sights, recoil patterns and talents to make this weapon truly personal to you. You can have a faster charge time, improved slide, frequent grenade feed, tighter spread, and faster zoom, or any other combination you can think of.